Conservation initiatives are an important part of the work we do at the Aquarium of the Pacific. 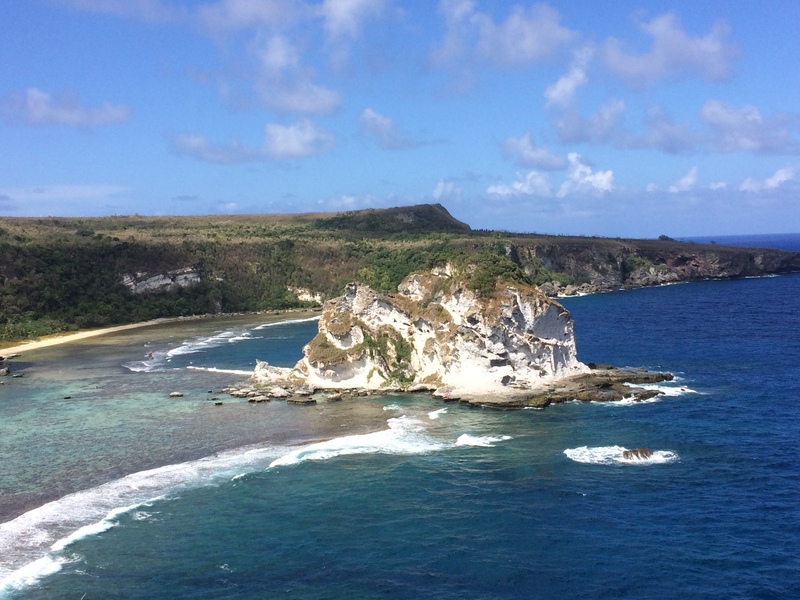 Mammalogist Katie Finch traveled to Saipan in the Northern Marianas Islands to participate in field work that benefits rare birds, and she’s here to tell us all about it. 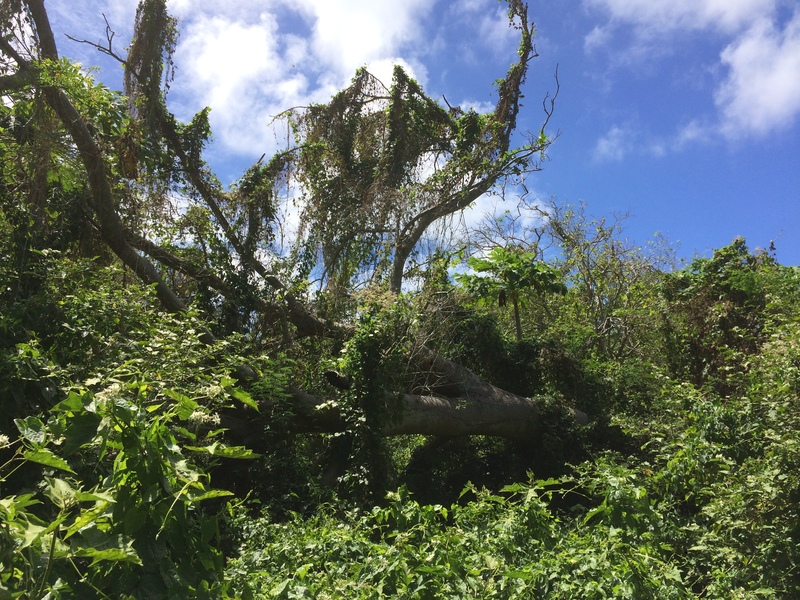 Ever since the notorious brown tree snake eco-disaster in Guam, the conservation of birds in the Northern Marianas Islands has become increasingly important. For those not familiar, brown tree snakes were accidentally transported to island in the 1940s (most likely on ships from New Guinea) and wreaked havoc on the bird population. Many of the birds that once inhabited Guam are now extinct. The Northern Marianas Islands are just north of Guam, and during the past decade there have been brown tree snakes spotted on these islands, as well. 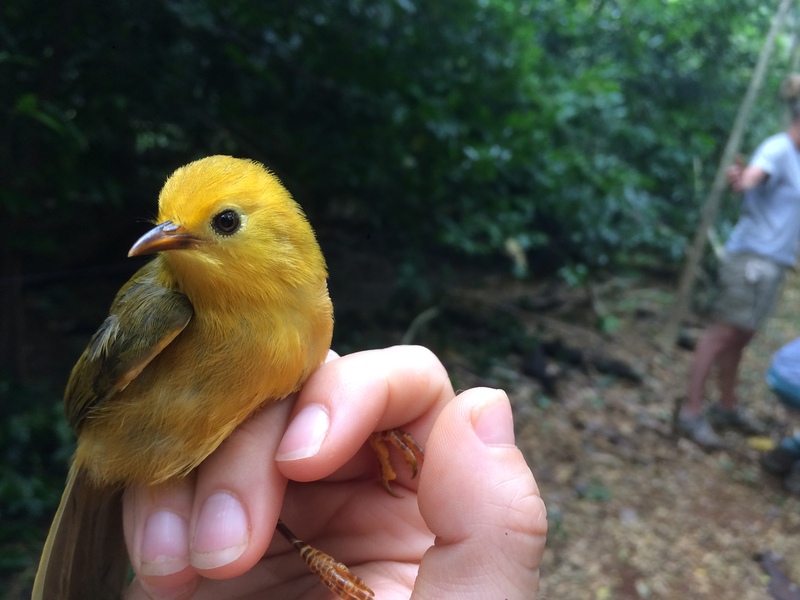 In response, the Mariana Avifauna Conservation program was established in 2004 to create species survival plans for native birds of Saipan, Tinian, and Rota. The objective of the project is to create insurance populations of these rare birds in zoos and aquariums accredited by the Association of Zoos and Aquariums, and most importantly, on neighboring islands where there is no risk of the snake’s arrival. The first few days of our field work trip revolved around getting the bird room ready and establishing our field sites. First, we cracked into the shipping container of supplies that lives on the island year round and built the bird boxes in The Bird Room, where we took care of the birds along with the vet team. The field sites are located in the dense forest or fields without any trails other than those made by wandering wild cattle, so we spent a lot of time making trails by cutting through the greenery with our machetes. 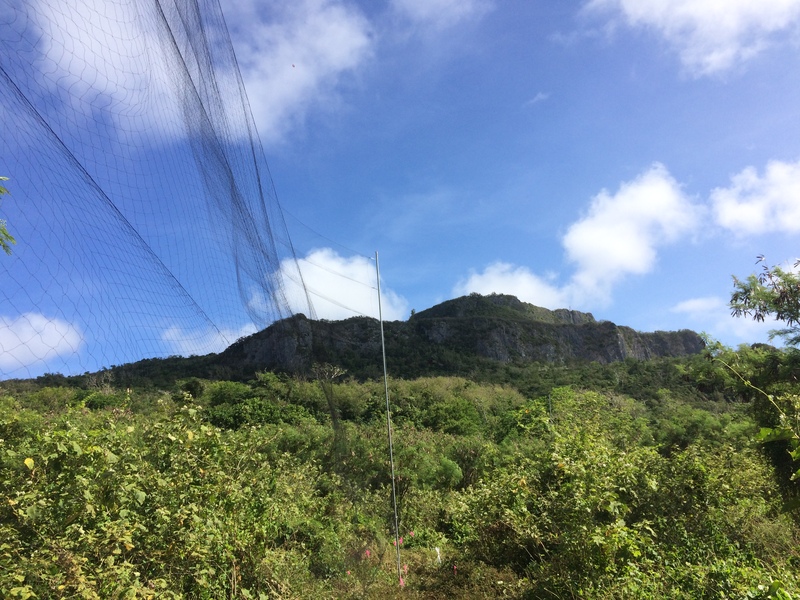 Once we arrived at the sites, nets and materials were set up that helped us gather birds. Every field season focuses on two species. This year the opening crew worked on gathering the Mariana Fruit Dove and the Rufous Fantail so that the closing crew could move them to the remote, uninhabited island of Guguan. The Mariana Fruit Dove typically inhabits areas that look like big open fields. They are beautiful birds that look like someone took a pigeon and gave a painter free rein. Not only are they beautiful, but also they are famed for their sweet, fruity smell. Our other target species was the Rufous Fantail, which is a small bird that populates dense forest areas. Since they eat small insects, we had to catch flies during the day to hand-feed them to the birds later on. Once everything was set up, we spent most of our time rotating between each field site. When a bird flew into the mist net, we worked quickly to remove it safely. Bird families often fly together, so we took notes when a pair or family were together. Making sure these groupings stayed together increased the likelihood that the birds would thrive in their new environment on Guguan. Field work is tough work. Most days we were up at 5:00 a.m. and out in the field until as late as 7:00 p.m. When we weren’t in the hot and humid jungle, we were feeding and taking care of the birds in The Bird Room. Some of my colleagues also went out into the community to local festivals or to elementary schools to educate the local community about the program and bird conservation. But the long days were all worth it! 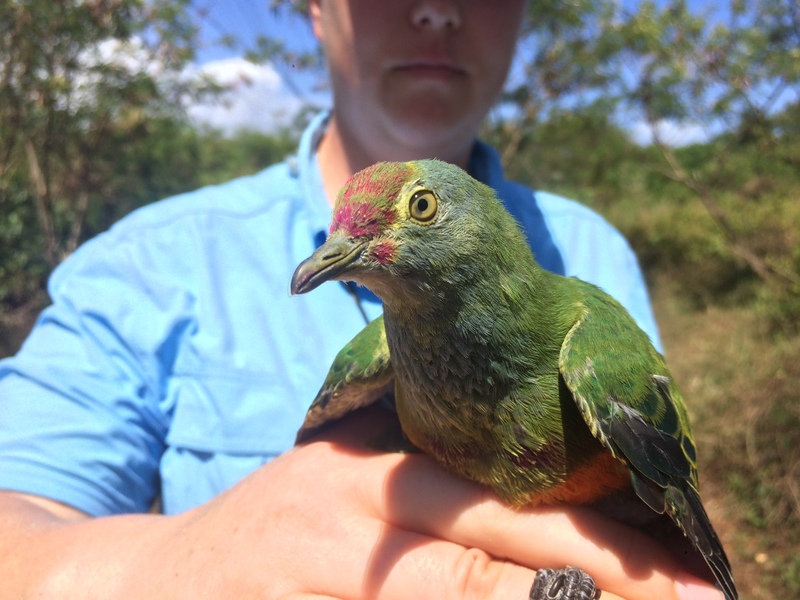 I love telling everyone about the experience, from the abundance of life in the jungle (like a monitor lizard barging through my observation site) to the magical smell of the fruit dove. Most importantly, I’m proud to have been a part of a conservation project that is having a direct, positive effect on the many beautiful birds of the Northern Marianas.